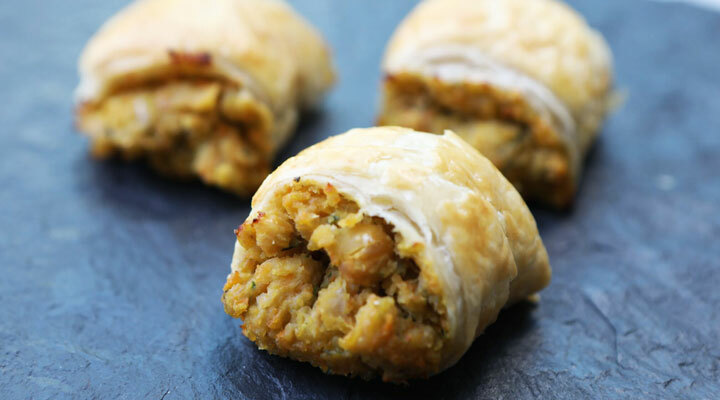 Our chickpea rolls are a great vegetarian alternative to traditional sausage rolls. Preheat the oven to 180 C. Line a baking tray with grease proof paper. Remove the pastry from the freezer and set aside. Add chickpeas, grated veg, onion and garlic to a food processor and blitz for 30-40 seconds. Transfer to a large bowl and cover. Place in the fridge for 15 minutes to set. Meanwhile, roll out the pastry and cut down the middle into 2 long rectangular strips. Brush with the beaten egg and cut each roll into 8 pieces. Transfer to the lined tray and bake for 20-30 minutes until golden, crispy and cooked through. Serve warm. *If freezing, cut each roll into 8 mini rolls and place in the freezer here.